42 Properties Found. Page 1 of 4. 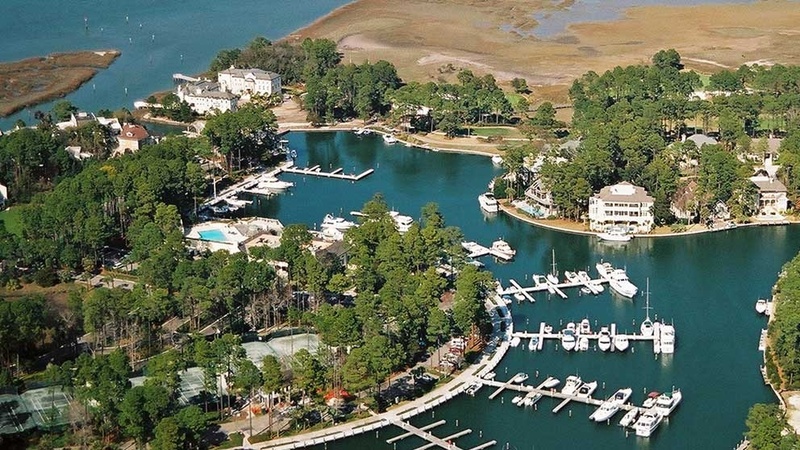 Hilton Head Island’s Very Own "Venice"
Wexford is South Carolina’s unique private golf club community in that it offers yachting in its elaborate interior 37.5 acre harbor. Winding around the harbor is the exclusive 18-hole championship golf course. At the headwaters of the harbor and the start and finish of both nines is the Clubhouse complex consisting of the Clubhouse with fabulous dining options, swimming pool, lawn and racquet club and children’s playground. Wexford takes pride in its reputation as a friendly, active, family-oriented community. Instead of focusing on public resort facilities, the community offers a distinctive private lifestyle right in the midst of the Island’s natural beauty and only a short bicycle ride to the beach. Wexford’s "Venice" connection distinguishes it from all other private golf club communities in the state. Just like the famed city of Venice in Italy, throughout the entire community has large canals where residents can keep their yachts or boats behind their homes, travel out to the Intracoastal Waterway or visit fellow residents by boat. The canals are part of the singular, locked Wexford harbor that is free of tides. A spectacular view of spacious, uniquely landscaped homes located on the glassy harbor will greet you as you enter the community. Right behind the homes the large yachts and smaller boats are tied at each home’s private harbor-front slip. Seven wonderfully designed, stone bridges cross this harbor taking residents to their islands-in-the-harbor homes. The creative team that developed the community hired the services of renowned golf course architect and land planner Willard Byrd to conceive and design the course. Byrd drew his inspiration from the inland canals of Ireland, featured in a National Geographic article, to design the community and the course. He set about his task of designing around a concept for a lock-controlled harbor, enveloped by a beautiful golf course, and interspersed with residences. As a result, the homes were designed to front either the harbor, the golf course, the marshes, or an interior lagoon. The architectural theme traces its roots back to the British West Indies, which is a reflection of the post-revolutionary war history of Hilton Head Island. Wexford possesses some of the most magnificent, refreshing home design in the Hilton Head area. No two homes in Wexford are the same. To learn more about Wexford, click this link to download our FREE e-book Everything You Ever Wanted to Know about the Private Golf Club Communities - here you'll get thorough description of Wexford’s amenities and all fees associated with living and playing in Wexford. As an added bonus you'll also get this same information on all the Hilton Head area's Private Golf Club Communities. If you have questions about specific homes or real estate in general, contact us. We're happy to help.